Billy Horschel’s hot run on the PGA Tour continued, as he was able to come from behind to win his first PGA Tour event at the 2013 Zurich Classic of New Orleans. Coming into Sunday, the PGA Tour decided to move up the final round tee times due to the threat of inclement weather, and that definitely came into play. Two separate delays, including one with the leaders in the 18th fairway, prevented the event from ending on time. As Horschel walked to the 18th tee, he carried a one shot lead over playing partner D.A. Points, thanks to eight birdies on his card, including six in a row from 7 to 12. Horschel found the left rough off of the tee, while Points was in the fairway when the second horn blew to halt play. When the tournament resumed roughly 40 minutes later, Horschel decided to lay up in the fairway, while Points got aggressive and found the bunker. Horschel’s approach gave him roughly 26 feet for birdie, while Points hit a solid bunker shot to about six feet. 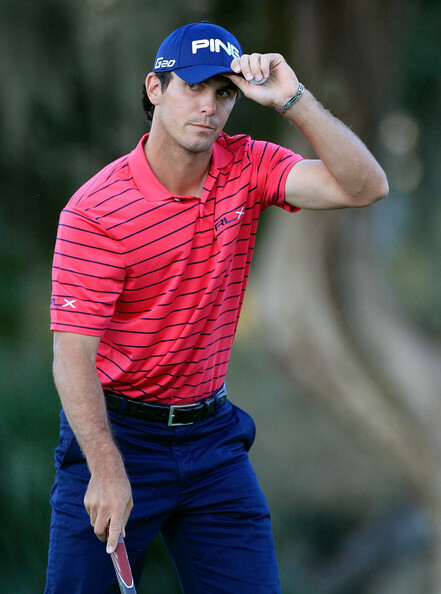 Make the putt, and Horschel would walk away with his first PGA Tour win. Horschel was on a hell of a run coming into the event, having finished inside the top-10 in each of his last three starts, so people shouldn’t be surprised to see his run of good form continue. His win makes him exempt on the PGA Tour for the next two years, and gets him into all of the majors, including next year’s Masters. Horschel, much like other 2013 PGA Tour winners Russell Henley and Brandt Snedeker, is a breath of fresh air for those who watch the game closely. He plays fast and has tons of emotion, which hasn’t exactly been the norm out here over the years. At points in Sunday’s final round, he appeared to get a little jumpy out there, but he calmed down and was able to get the job done. The question now is whether this will open the floodgates for Horschel and we’ll see his success continue, or if he’ll join the litany of other players to be one and done. My bet is on the former. Horschel is exactly what you want to see when you are trying to make GIFs of a PGA Tour broadcast. I’m not sure what exactly he’s doing here after making bogey on the 15th, but the quick scorecard grab from his caddie is pretty obvious. Lastly, Horschel’s caddie needs to get it together. When the players were called off the course, they were shuttled back to the clubhouse, and for some reason, Horschel rode in the back. Seems like an easy way for a guy to get hurt, as opposed to the comfy seat up front. The ground TPC Louisiana is built on is pretty much the flattest piece of land on the PGA Tour, which you’d think would make it one of the more boring layouts on the schedule, and while it isn’t one of the more iconic courses out there, all of the standard Pete Dye tropes are there. Dye designs typically make players visually uncomfortable, with very few straight shots, small, undulating greens and well-placed bunkers. There might not be a better example of those well-placed bunkers than the 7th hole at TPC Louisiana. From the overhead view of CBS’ cameras, you can see four bunkers on the 7th hole. Three of them are pretty normal, but there’s a tiny one right in the middle of the fairway, about 275 yards from the tee. 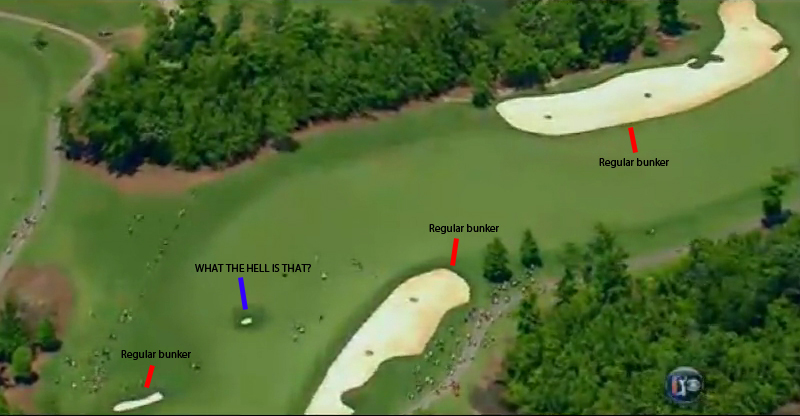 That’s the prime landing spot for tons of PGA Tour players and really, is just a nasty bit of placement by Dye. I’ve talked about this before, but once again, the PGA Tour can’t seem to adequately figure out how to broadcast an event in 2013. Thanks to the weather problems, tee times were moved up significantly ahead of Sunday’s final round, ensuring that the leaders would be done by the time CBS came on the air at 3:00 PM ET. I understand there are issues at play here with getting the tournament broadcasted when the schedule changes, lord knows Golf Channel and CBS wouldn’t want to change regularly scheduled programming nor would they be happy if it was available online, but there should be some way to watch the coverage when it’s happening live. It’s the same problem they have when you can’t watch whatever players you want to watch, and are forced to watch the regular broadcast or selected holes. Yes, there are logistical problems involved, but when you compare the PGA Tour to other leagues and what they provide, such as MLB.TV, you can see how far behind the times they really are. Wildlife frequently come into play every year on the PGA Tour, but this one is something different. In Thursday’s opening round, a three-legged alligator named Tripod decided to roam the fairway before slinking back into the water. Yes, the 14-year old finished in last place this week, but the fact that he made another cut on the PGA Tour is pretty incredible. Of the guys who missed the cut this week, there’s 107 PGA Tour victories between them. Tianlang beat all of them. Usually the fawning over a young golfer is a little much, but in this case, it’s deserved. Tianlang says he will likely try to qualify for the U.S. Open, but he has no plans outside of that. People have been trying to tell him what to do in an attempt to prevent him from failing to reach his potential, but really, he should just do whatever makes him most comfortable. Whether that means accepting sponsor invites to pro tournaments or trying to become the best amateur player in the world (he’s currently ranked 78th), that’s what he should do. There’s no set way to becoming a quality pro, and anyone who tells him that there is simply isn’t correct. Notables missing the cut: Cameron Tringale, Seung-yul Noh, Shane Lowry, John Merrick, Aaron Baddeley, K.J. Choi, Ben Crane, Charley Hoffman, Scott Stallings, Keegan Bradley, David Lynn, Brendon de Jonge, Justin Leonard, Robert Allenby, Mike Weir, Thorbjorn Olesen, Camilo Villegas, Jordan Spieth, Johnson Wagner, Michael Thompson, Rory Sabbatini and Charles Howell III. He became a bit of an afterthought towards the end of Sunday’s final round, but 54-hole leader Lucas Glover had a solid week. He’s always been a superb ball striker that struggled with the putter, but he seemed to roll it pretty well here. He’s definitely disappointed with the way he finished, but he’s on the right path to getting his game back, and considering he’s only got one win since the 2009 U.S. Open, he should be happy about that. Of course, there was an interesting sidebar to Glover’s story. His wife is due any day now with their first child, and Glover reiterated after the third round that if he was called during the final round and told that his wife was in labour, he was booting it out of TPC Louisiana, regardless of where he was in the tournament. That’s a player who seems to have his priorities in order.